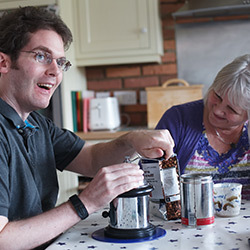 Home > News & press releases > How can Music Therapy help people with a brain injury? An acquired brain injury is an injury to the brain that has happened since birth. There are many causes such as trauma, a stroke or a tumour. Effects can be wide ranging from balance problems, speech problems, muscle weakness, to cognitive, emotional and behavioural effects. These effects can be extremely difficult for the individual and their families to cope with, so rehabilitation needs to be effective in order to help re-build confidence and independence in one’s abilities. With an acquired brain injury, Neurologic Music Therapy (NMT) has been proven to be an effective treatment in helping to improve the quality of life of the injured individual. Verbal communication can be improved greatly through music. Those who have suffered a stroke for example, and have lost the ability to communicate verbally, can use music to help develop new pathways in the brain so that verbal communication can be learnt again. 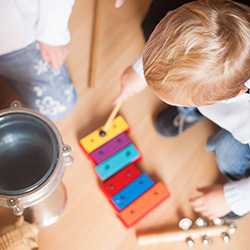 Music therapy works by connecting music and movement by accessing undamaged parts of the brain to learn and re-teach functions that have been impaired. Music, for any one of us, can help improve mood, but when living with an acquired brain injury, it becomes an even more important part of rehabilitation to help elevate mood. The music needs to be personally tailored to the individual so to evoke a strong, emotional response, and the music therapist works closely with each individual to ensure the music choice is right for them to achieve their goals. Studies have also shown music therapy can help reduce agitation & aggressive behaviour as well as improve mood, it can also assist communication and improve physical coordination. Music is a powerful tool not to be underestimated. In general, music therapy, allows people to become more aware of themselves, their actions and the overall coordination of movement. It identifies emotion by using musical aspects, tones and rhythms to communicate with the different receptors in the brain. As a result of music processors being present all over the brain and despite the damaged area, musical neurons are used to gain access to the non-damaged parts. It can stimulate and develop new aspects such as walking or communicating, taking away the focus from learning directly. It allows the body and functions of the brain to respond to music and re-learn behaviours that were lost, helping individuals gain back control of their life. If you would like advice about music therapy, bringing a clinical negligence claim, capacity, managing the award of compensation or any other aspect of brain injury welfare, legal or financial advice, we have specialist brain injury solicitors and Court of Protection solicitors who can assist.